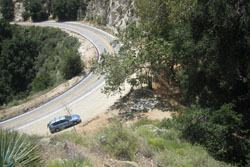 When the road starts to climb, be on the lookout for a hairpin turn that has, on the right-hand side of the road, a wooden frame that used to hold an interpretive sign. Park here (you'll need a parking permit - see below). Be on the lookout for poison oak! To park anywhere within the National Forest, you need a US Forest Service Adventure Pass. They cost $5 a day and can be bought on-line or at various vendors. At the site, walk on a crude trampled path back under a huge live oak tree, about 30 meters (100 feet), where you'll find a cliff amphitheater that has a nice waterfall in early spring. 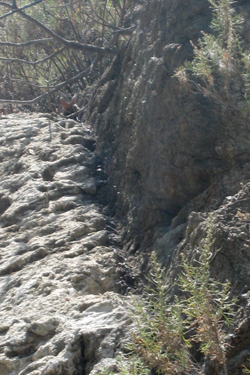 If you stand close to the east side (or scramble up the east hillslope a bit), you have a spectacular view of the San Gabriel fault (vertical black line) on the vertical western cliff face, separating light-colored "Josephine granodiorite" on the left from dark-colored "Mendenhall gneiss" on the right. 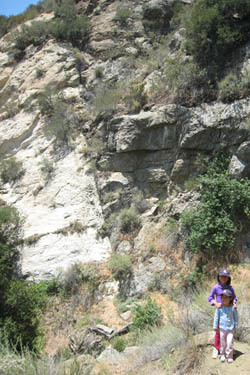 From 13 million years ago until 4 million years ago, everything south of the San Gabriel fault slid, earthquake by earthquake, a total of about 40 km (24 miles) to the northwest. At that time, the San Andreas fault did not exist north of the San Gabriel mountains; rather, the San Gabriel fault was the main fault. The San Gabriel fault is almost surely fully extinct now. Something about the mystery of the black layer!